A few days ago, Keith Klain, Executive Director, CEO, and a highly recognized leader in testing industry made a comment on Twitter. It was disheartening for me to witness over the years that one of the most passionate context-driven leaders, the one who taught empathy and humility, degraded his expressions to name-calling, straw man arguments, and marking targets for bullying by short-sighted neophytes. The sad irony here lies in the hash tag: “scrutiny is not bullying“. Indeed, there are similarities in appearance that conveniently allow hiding bullying under the facade of scrutiny. But going back to the point made – there was a number of responses on Twitter. I responded too – and this is where it went. At this point, I took a pause. 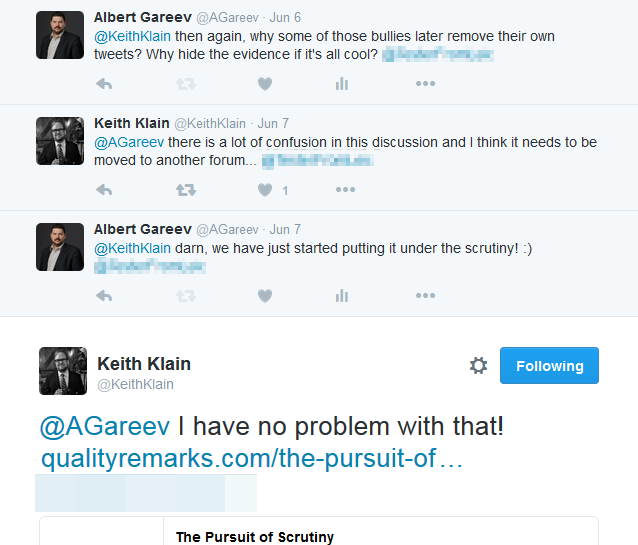 Those reading my post, please take a pause, too – and read Keith Klain’s “The Pursuit of Scrutiny”. This is an incredibly powerful piece. I collect master pieces that serve me as a source of inspiration and energy. The moment I read that sharing, I knew that I got another jewel for my collection. And I also felt a bit of a cognitive dissonance. So I took a pause to assess different framings of the subject and see if I can put my thoughts in a coherent and cohesive way. I begin with the following..
How do I put these together?! In my perception, Keith Klain has been (and I believe – will be) the spearhead and bright example of business success in testing and test management, as well as society growth. I more than respect him. I learn from him. So seeing that such a leader takes this stance of seemingly supporting relabeling of bullying as a scrutiny, as a challenge to welcome was ..shocking. Now, he’s got a strong argument – his own experiences, his openness to criticism and even personal attacks. But this is not just about me. My successes and experiences shield me from worse than insults and harassment, be that online or in a public meeting. I admire Keith’s aikido mentality as well (“I reject that premise as no idea, person or thing defines me – so it is impossible to offend me”), and maybe one day will master it, too. This is about young graduates and newcomers to our trade, who make their first attempts to connect with seasoned testing professionals, and discover themselves ridiculed for naivete of their questions. This is about testers who for the first time felt that they helped to make the project successful and are eager to share their story. This is about programmers who took their personal time to contribute to creation of an automated testing suite and hear their work disregarded as “not testing”. And this is about business and other stakeholders watching how veterans of the industry treat the newcomers. There’s actually a term for that: hazing. Hazing is seen in many different types of social groups, including gangs, sports teams, schools, military units, and fraternities and sororities. Alas, seems like some parts of the testing community also felt for that. Let me try to understand Keith Klain. I turned for the inspiration to his blog, public talks, and articles. I see a very strong oracle. Oracle – is a professional testing term for a heuristic principle or explicit rule used to evaluate results of observation. Typically, an oracle includes a model to assess against and the assessment rules. Both model and rules can be quite explicit (for example, mathematical model and comparison logic) and tacit and very subjective (for example, emotional triggers as oracles). I see someone who has grown in a very empowering environment. Someone who had a strong jump start. Someone who belongs to a group probably least associated with victims of bullying (women, people of various ethnicities, immigrants, people with disabilities, and other groups typically more often are targets of bullying comparing to middle age white males). I see someone who had grown himself through the hard work and tasted quite extraordinary successes. I see someone who possessed quite a lot of power – and used it wisely. Can petty insults touch such a person? No! Let me draw my thoughts here. As testers, we often do not rely on a judgment based on the single oracle, however strong it is. As hands-on specialists, we recognize that there’s but the experiential path to maturity and mastery, and this path might be longer or shorter. As leaders, we recognize the diversity of cultures and mindsets, and welcome the difference of opinions. As managers, we recognize the variations in ambitions and experience levels, and we help each team member to find their own unique path to growth. As people, we embrace the human nature, we admit that we’re less driven by logic and more driven by emotions, feelings, pride, and beliefs. So I’m saying to Keith Klain with all due respect and admiration. Sir, you’re an aspiration to many of us. You’re “someone that the testing community has needed for decades” – as it is written in the public endorsement given to you. You were raised in a strong empowering environment. You passed the trials of power. You’re simply older and more experienced than many of us. We are yet to arrive to the state of impenetrable skin and un-bendable will like yours. So please let us get our own experiences and learn from them. Please let us share our weaknesses and pains. Present you is not being judged on the basis of your teen age mistakes and weaknesses. Please do not judge us from the heights of your wisdom and power. And maybe take another look to separate friendly collegial questioning from the bullying sensu lato.